Over the past 17 weeks of the Lake Bluff Farmers’ Market we’ve come to expect our regulars week-in and week-out; it’s part of what makes Lake Bluff a great community – the people! From all of us at the Lake Bluff Farmers’ Market we say “thank you for your support.” Without it, our 20 years in Lake Bluff would never have been possible. Perhaps no one epitomizes the spirit of Lake Bluff – and the Farmers’ Market – like the lively group known – perhaps unofficially – as the Dawn Pilots. 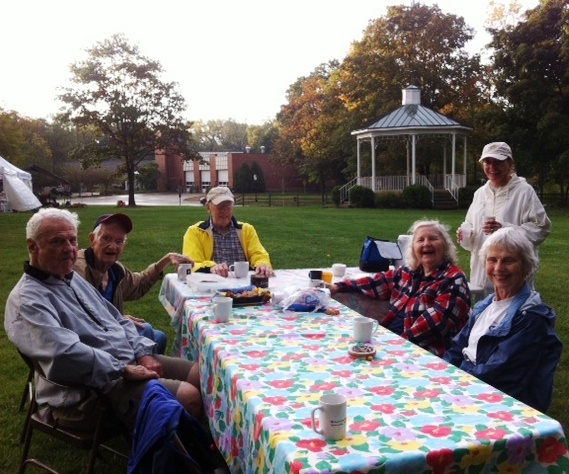 Talk about a great story – this group has come out every Friday morning for 17 weeks straight, arriving at 7:00 a.m. on the nose each and every week. They have even used past markets to do everything from celebrate birthdays to renew wedding vows! Check back for more information on the Dawn Pilots and other Lake Bluff Farmers’ Market fans. Join us for the last Lake Bluff Farmers’ Market of 2013 on Friday, October 11th to meet this great group of passionate market-goers and hear more about their unique stories and great camaraderie while perusing Fall’s farm goodies and more! ← Beers and Brats? Yes, please!